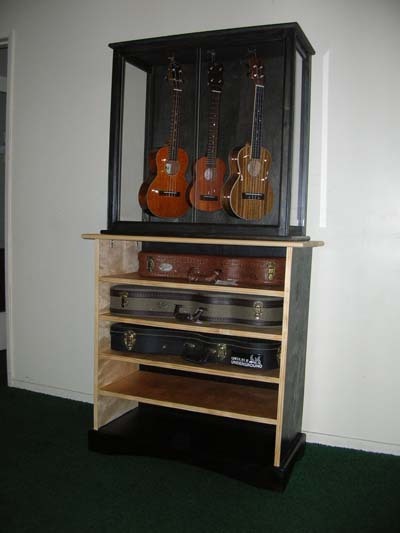 Our ukulele display case solves the age-old problem of where to put your ukulele when you're not playing it. Sure, you could put it in the closet, or under the bed, but if you don't see it, you won't be picking it up to play as often. You could hang it on the wall, but then what do you do with the case? Problem solved. 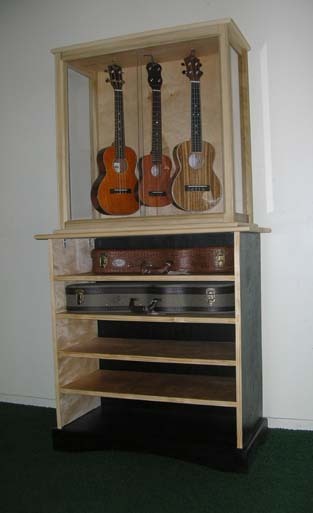 We designed these to accommodate tenor sized ukuleles, though soprano and concerts fit equally well. Though not airtight, a simple humidifier (not provided) placed inside the case will help protect your investment. Instruments shown here are not included with purchase. Our case consists of two parts. The upper part has a poplar frame with plexiglass front and sides to help show off your instrument. The tops are available with either a black enamel or clear finish. To address the question of what to do with an empty or extra case, the lower section is divided into wide, visible sections for you to easily keep track of your instruments. The separate lower section is made from 3/4-inch birch plywood with poplar trim. 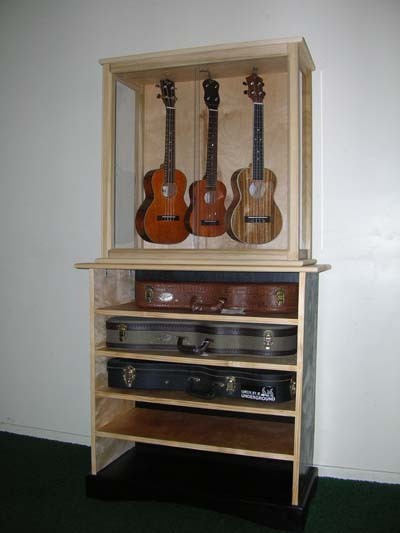 When designing this piece, we looked at our own stack of ukuleles and made a piece that covered about the same number of square inches of floor space as our ukes did. We show the top stacked onto the bottom here, but you can certainly purchase the top alone and place it on an existing table or even hang it on the wall. These move quickly through the shop, so please contact us for availability. The tops are $175/ea while the bottom piece can be had for $200. We can use PayPal, but we really should talk first. 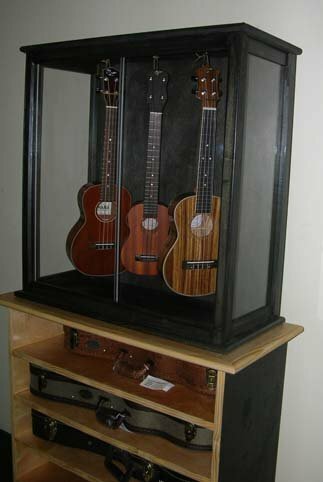 The ukulele display case is fairly lightweight but will not ship outside our area. We used to be able to do it, but no longer. So it will have to be picked up. Well, at least until we come up with a way to make them with "some assembly required." If you are in the Los Angeles area, stop in to see them at Guitar Merchant.